Mushrooms stuffed with garlic and herb cream cheese, coated with parsley breadcrumbs. 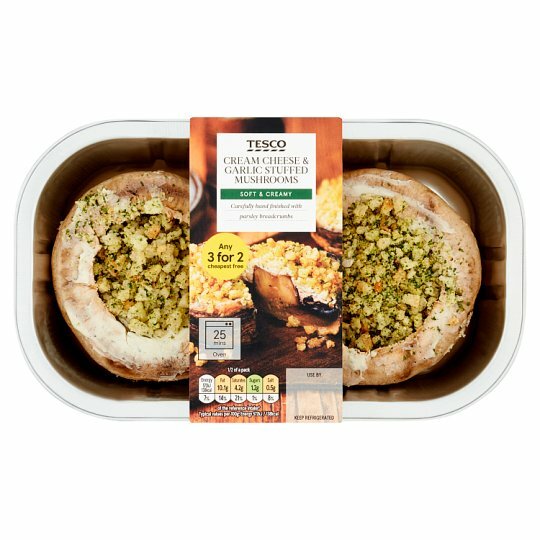 INGREDIENTS: Mushrooms (67%), Garlic and Herb Cream Cheese (25%) [Cream Cheese (Milk), Dried Garlic, Sage, Parsley, Marjoram, Thyme, Pepper], Wheat Flour [Wheat Flour, Calcium Carbonate, Iron, Niacin, Thiamin], Palm Oil, Parsley, Salt, Yeast. Instructions: Remove outer sleeve and film. Place the foil tray on a baking tray in the centre of a pre-heated oven for 25 minutes.